One of the reasons I have a blog is to maintain some art disciplines. I have to feed it regularly and if for whatever reason I haven't done much art in a while it ensures I find the time, energy or motivation - whatever is lacking - because I will need to post something if I don't want to let it die. So its not really a vanity exercise, although its nice to think that it may be of interest. The other major benefit of having a blog is that it's the place where I can keep track of all the blogs, websites and anything anything else art related that appeals to me on the Internet. A bit like a cyber Filofax for art. Award winning American pastelist Margaret Dyer who I discovered by chance somewhere along the line. I really enjoyed reading about the workshop she held last year in a place called La Bonne Etoile just south of Paris in France and bought her DVD The Figure in Pastels on the back of it - she's a good blogger and obviously an inspirational teacher too and I like how she uses colour and also her common sense approach. Like a lot of artists whose style is quite loose her draughting skills are of course excellent, so often that isnt appreciated. As a special two for the price of one deal I'll also introduce another artist who I discovered on Margarets blog, she attended the workshop, German pastellist Astrid Volquardsen. Her style is quite different but her landscapes are to die for, beautifully simple and highly skilled and her blog posts on La Bonne Etoile are worth a look see too. So thats my first BlogPlug, enjoy! Oh, and because I cant do a post without a picture this practice piece was done after watching Margarets DVD. I find your blog very interesting especially as you seem to attend a lot of local classes and groups around where I live. 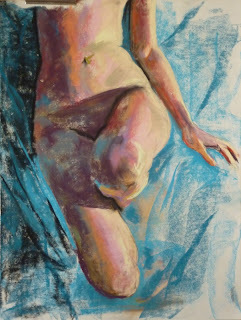 It was from your blog that I was able to see an image of a life model called Denise. I had spoken to Denise and emailed her a few times but never actually met her in person. She confirmed that your picture was indeed her good self. I am a local male life model myself and I think you may have drawn me at some time. You have a distinct way of writing the timing on some of you sketches. It reminded me of some sketches I had seen at one of my modelling sessions locally. Thanks for your comments lifeartistmodel - I dont know if I have drawn you or not but I do appreciate the hard work and professionalism of all the life models I have come across. Interesting that you got to 'see' Denise through my pictures, I have drawn and painted her a few times now and its always a positive experience. I hope your modelling is going well and maybe you'll let me know if we run into each other one of these days!